Science is SO cool – Like, really, really cool!! 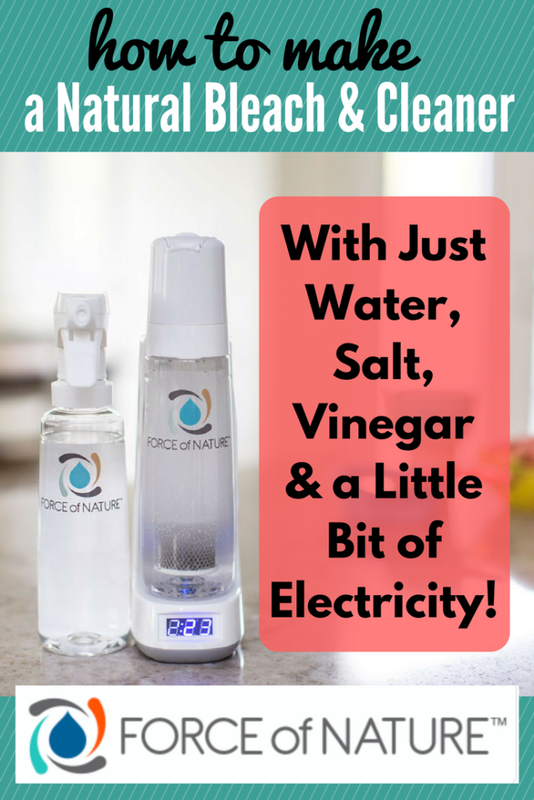 Did you know that if you take the right amount of salt, with the right amount of vinegar, and apply the right type of electrical current, you get a chemical reaction that creates a cleaning product as effective as bleach, but without the harmful side effects?!? Neither did I… Until I discovered Force of Nature. Sodium Hydroxide – A detergent & grease-cutter that cleans (but without the bubbles). Contains a safe concentration of 0.0000003% yet cleans as well as major brands that have up to 5%. Hypochlorous Acid – A cleaner & deodorizer that’s as effective as bleach, yet non-toxic. It’s very safe to use around your kids & pets because it has zero harsh chemicals. Hypochlorous acid is the same substance your white blood cells produce to keep you healthy, and it’s commonly the active ingredient in wound, eye and veterinary care products because it’s so safe and effective. Unlike bleach, hypochlorous acid is safe enough to spray on the surfaces children come into contact wth, even pacifiers, without needing to rinse. 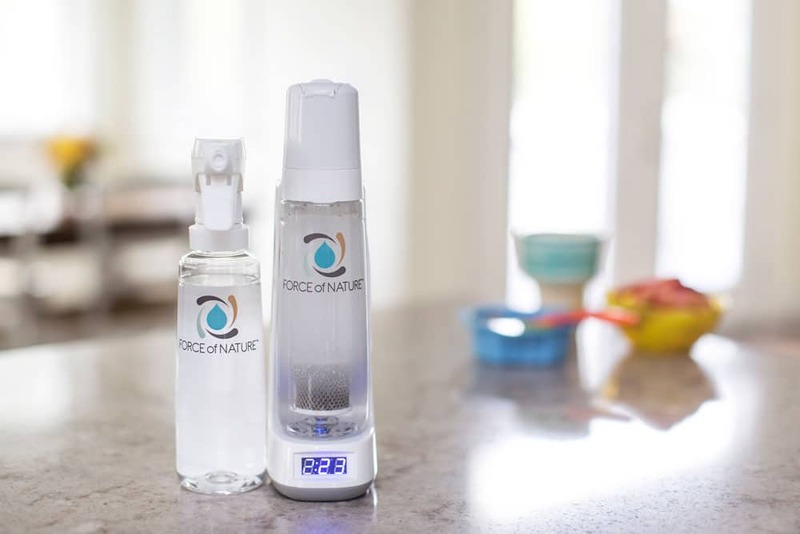 Force of Nature is the first product that allows you to make electrolyzed water at home, right on your countertop. So, after learning all about the science behind it, I decided to purchase a Force of Nature Starter Kit for myself & put it to the test…. and I mean REALLY test it. It’s been 6 months, and I’m LOVING it! I use it on my mirrors & windows, counter tops, sinks, faucets, tabletops & for my final wipe down on the toilet. I also have a front loading washer that occasionally gets a little smelly… I just dump a bit of this into the washer drum & run the cleaning cycle – it works amazing! You don’t have to be a scientist to make this product work… Force of Nature has made it as simple as pouring tap water into the activator bottle, adding a pre-measured capsule, and pressing ‘start’. Give the machine about 6 minutes to work its magic and voila! The solution is ready to use! Plus, it seriously costs pennies compared to other cleaning products – especially when compared to the natural ones that cost a fortune. With so many allergies & sensitivities in our family, it’s important to me that we only use natural & safe products to clean. Plus, it’s better for the environment & saves me a ton of $$ by not having to buy a variety of cleaning products. There’s no commitments, contracts or hidden fees… Try it and love it… Or send it back within 30 days for a full refund. You even get FREE Shipping on every order. 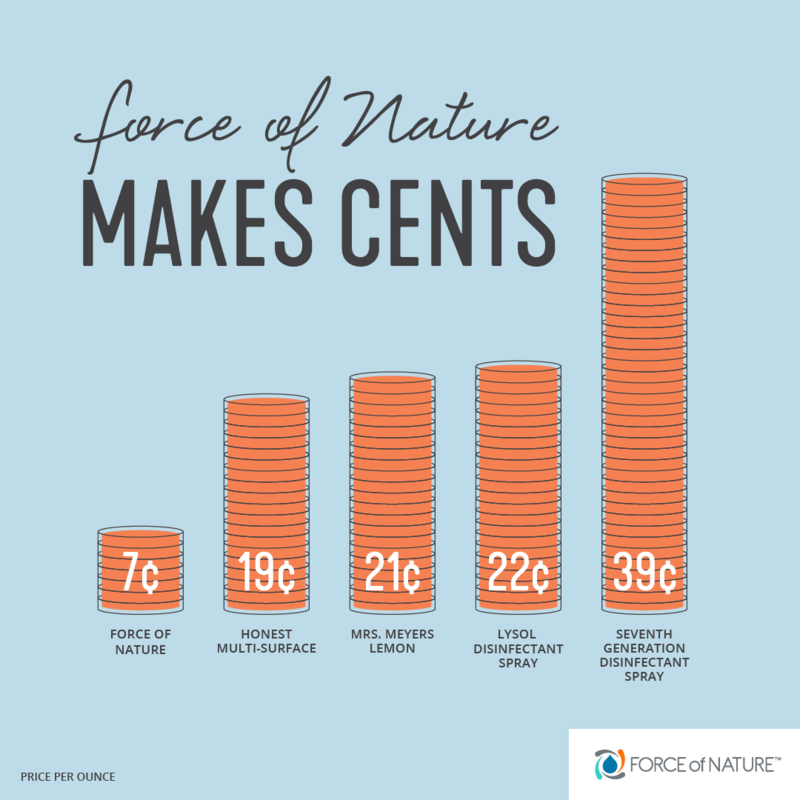 Have more questions about Force of Nature? You can check out their FAQ page over here… Or leave me a comment below & I’d love to share more about my experience with you. This is not a sponsored post, just my honest opinion about a product that I purchased with my own money. I am using affiliate links, which means I might get a small percentage of the sale if you decide to buy through my links… It doesn’t cost you anything extra. Plus, every penny I earn goes right back into keeping this site up and running – Thanks for your support! « Gluten Free & Vegan Hearty Cookie Recipe – NO Oats!